I'm in the process of helping my very talented and very beautiful girlfriend setup her own blog for her website. She's a great artist, but not very knowledgeable when it comes to computers. So we both sort of decided it would be best o use a blog for her to post her artwork and insights online. Right now the site is a little bare, but she plans on uploading most of her work over time as well as post all sorts of crazy thoughts and ideas that come out of her head. I encourage you to check out her site, I think you may really enjoy the artwork. although creating vibrato is not that difficult. using it correctly so it achieves a realistic appeal is dificult. never start a note with vibrato. this sounds un realistic. start instead with no vibrato then using the amount knob on your lfo bring in the vibrato. never end a note with vibrato. always fade the vibrato out completly or partially before ending note. again we want this to sound realistic. if you think of the human voice. u simply cant start and end a note doing a vibrato. your vocal chords dont work that way. the speed of the vibrato is one of the most important things to consider. too fast and it sounds synthetic. too slow and it sounds simply like fading volume control. u want u set your lfo speed to oscilate somewhere with in each quarter note and each eighth note. the exact setting will vary depending on the effect u want and the sound. For this tut im using synth1. 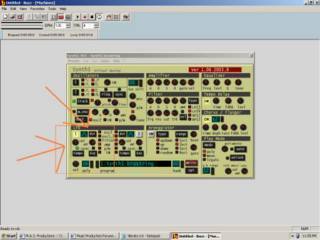 a freeware synth anyone can download. To experiment simply use the default synth1 brastring which is loaded. goto the lfo section, and set it to only 1 lfo is on and assign it to the amp. for the wavform i reccomend using triangle. if you happen to have pink noise on another synth for a lfo wavform option u might want to use that. pink noise is noise with a variable degree of randomness to its waveform. this randomness creates a much more realistic vibrato sound as it doesnt perfectly oscilate the same everytime. fine a nice tempo or speed setting for your lfo. on the synth1 i have the speed setting to 12 o'clock. play your note. u should hear your vibrato now. to make your vibrato more realsitic automate your lfo amount setting. Play a phrase. At the beginning of your phrase you should have almost no vibrato. then gradually bring the vibrato in. At the end of the phrase u can either cut it or fade it out, but it should never be held over when a phrase ends, b/c u get an unrealistic vibrato sound. remember vibrato should be subtle and should never dominate the sound. attached is an example from what i did above. for the example i assigned the amount to a knob and continually changed the lfo amount. nothing static. Well today is sweet Day. My sweetie probably will never read this but ill just do a little ditty on how much I love her. We often times get into fights and quarrels all the time. I think it comes more from just us miss-understanding what we mean when we say something. Neither of us tries to hurt each other. I want her to know how much I really try to do everything with her in mind. I really look forward to little things in our future, like having a house, living together, things like that. For those of you who don't know we have been together for nearly 7 years now. Yeah since sophomore year in high school. That really stands the testament of time. I know she often times gets very upset with me for what I say and do. In all honesty I'm just too stubborn most of the time to just admit I'm wrong or let a subject die, and I usually create a bigger situation then exists. For example last night we had a brief fight. She is very touchy about her mother, and I usually try not to bring the subject up in fear of provoking a negative emotion. This however lead to a misunderstanding on my part as to what she meant by when she said she wanted some of her mother's things. I thought she wanted like the furniture and most of the belongings from her parents house. I had this fear that she was going to transplant her parents stuff into our new home, and hence I would be living in not "our" home but her home. I actually thought this for over a year and was kind of scared of it. That wasn't what I wanted. Just yesterday I found out however that this was not what she was referring to, she was referring to her family hierlooms and nik naks. These of course I don't have any sort of problem with at all. Those are the sort of things that are really special and such and are supposed to be passed down. So needless to say we both sort of miss-understanding each other. I think we both were a little crabby and looking for a fight. Yeah. well In case you have read this blog honey. Bare with me, I love you soo much you cant imagine. Hopefully you can bare with me for the rest of your life.